Scanning Acoustical Microscopy (also referred to as C-SAM) is a non-destructive method of inspection of the internals of plastic IC’s for anomalies (delaminations, cracks, mold or bonding compound voids, etc.) using ultrasonic pulses. Delaminations and cracks inside plastic IC components are usually caused by temperature cycling during manufacture, assembly, or in-use conditions. Delaminations and cracks have serious reliability implications, since they allow moisture to collect at interfaces that often result in electro-corrosion failure modes. 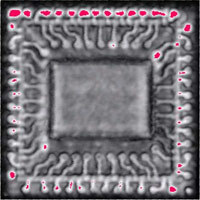 Scanning Acoustical Microscopy is the only non-destructive, reproducible technique to detect these anomalies, and as such, is used as a part of the test for Moisture Sensitivity Classification (IPC/JEDEC J-STD-020). 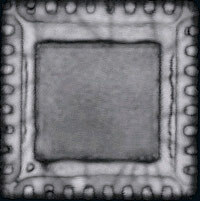 Voids in die bond epoxy can cause failure modes due to inadequate heat transfer. These defects can also be reproducibly detected using Scanning Acoustical Microscopy. In C-SAM mode, the tool can be adjusted to locate each interface, and their relationship to the detected anomalies.